Wait, how is already December? Just five minutes ago, I was laying out in the sun, soaking up the last few rays of the season. Almost overnight, the days became darker and the air became chillier. I feel like the holiday season arrived before I could fully prepare! Do you feel the same way? If you’re a little behind on your holiday crafting, you’re not alone. 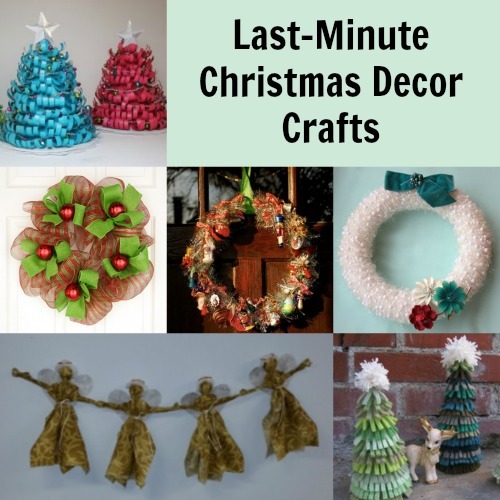 Luckily, you can still make plenty of crafts before December 25th. Decorating your space for the holiday season is by far one of the best aspects of Christmas, so don’t miss out on the fun! These holiday projects aren’t too complicated or difficult – if you have some crafty skills and an urge to decorate, you’ll be well on our way to finishing at least one of these projects. Wreaths in particular are a great seasonal treat – you can hang out on your door or simply add it to a blank wall for a pop of cheer. Additionally, there are plenty of handmade garlands, stockings and tabletop trees to help you show off your spirit. Don’t let the holiday season pass you by – sit down, relax and make a few Christmas crafts before it’s too late. 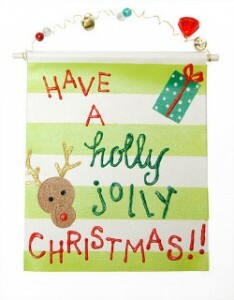 Holly Jolly Christmas Reindeer Sign – Rudolph makes a surprise appearance in this clever Christmas craft project. Simple Striped Santa Stockings – A great project to work on leading up to Christmas Eve. You can also make one and give it as a meaningful gift. Grandma’s Angel Garland – Grandma would love this country-inspired Christmas craft. Dazzling Christmas Centerpiece – An eye-catching design that’s sure to please. Place this sparkly table topper on your Christmas party table. Felt Sweater Christmas Trees – Save old sweaters and use them for something fun and practical. Knit Christmas Stocking – This is a more advanced project but that doesn’t mean it isn’t so much fun to make. Frilly Paper Trees – The more colorful the paper, the better! Cover your table with these Christmas trees and make it a memorable holiday season. 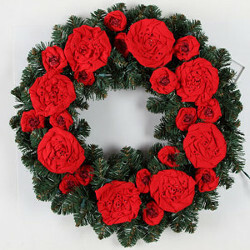 Rosy Cozy Christmas Wreath – This wreath is both pretty and traditional. The beautiful posies add an unexpected dimension to an otherwise unexciting Christmas wreath. 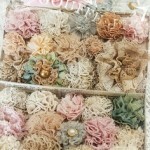 Vintage Winter Wreath – Take a trip back in time! Homemade Christmas decor can help you feel warm, toasty and oh so cozy. Peppermint Sweets Christmas Wreath – All the sweetness, none of the cavities! Satisfy your sweet tooth with this handmade wreath. Mesh Christmas Wreath – An unexpected take on a traditional project, this wreath will change the way you look at DIY Christmas crafts. Who wouldn’t want to hang one on a door? Christmas Cool Ornaments Wreath – Kids and adults alike will surely appreciate this fun and festive wreath design. Candy Cane Crochet Wreath – This project may look complicated, but it’s so easy to complete. Everyone will love his handmade Christmas wreath and will want to know where you bought it! What Christmas crafts will you make this year? Sweater weather is here! 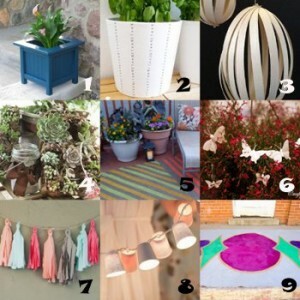 It’s time to break out the mittens and scarves … and get started on all the DIY home decor plans that you’ve been thinking about since August. If, however, you’re struggling to find some easy fall crafts that aren’t specifically for Halloween or Thanksgiving, don’t worry! 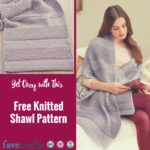 AllFreeSewing has got you covered. Get your house into the spirit of autumn with these Five Unexpected Fall Craft ideas! 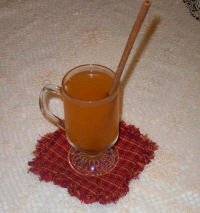 Rest your apple cider on this shabby-chic Harvest Raggedy Quilted Coaster. 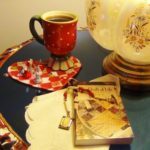 You could really make use of these wonderful DIY coasters year round, but they’ll be especially appropriate in autumn. Those deep reds and soft, frayed edges bring a bit of that cozy fall feeling to the table. Doors and mantels don’t get nearly enough love when it comes to home decor. 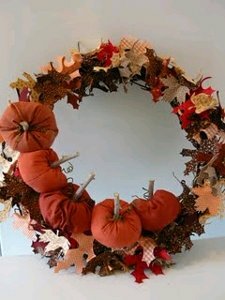 This gorgeous homemade Fall Wreath will put the perfect finishing touch on any room. It will look great welcoming people onto the front stoop or lending a seasonal touch to your fireplace. Never underestimate the effects of a good table runner. They give a set table that finished look that brings the whole meal—and the whole family—together. 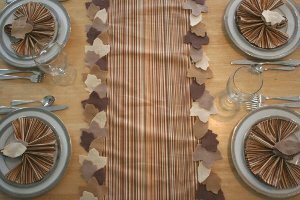 Use the Fall Leaf Table Runner and Napkin Rings to give your dining room a warm autumnal touch. A homemade garland is so simple to make and looks so beautiful strung over a doorway or along the ceiling. 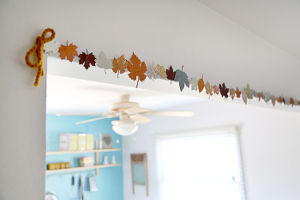 This DIY Fall Leaf Garland from Julie Ann Art will brighten up absolutely any space. 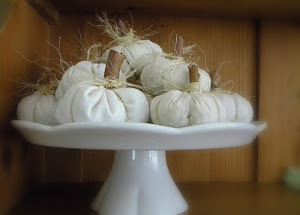 These wonderful Decorative Homemade Tabletop Fall Pumpkins are understated, but so classic. 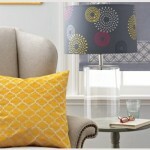 They’re the kind of decoration that draw the eye without overpowering the rest of the room. They take no time at all to make and look wonderful in almost any space—on a table, a shelf, a mantel, even a front stoop! You can’t go wrong with this adorable pumpkin decorating idea. Until October 28th you can enter our AllFreeSewing and Fishs Eddy Giveaway! 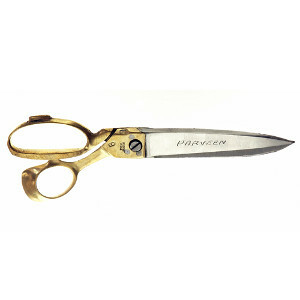 Win a pair of Tailor Scissors 9″ to create gorgeous, unexpected fall crafts with clean, straight lines. Read the review and enter here! What’s the most unique fall decoration you’ve ever seen (or made)? It’s amazing how quickly graduation season rolls around each year. If your family members or friends are donning that black cap and gown, it may be time for you to think about homemade gift ideas for the graduate in your life. For my own part, I’ll admit that I’m still mourning the long-lost college life and that sweet season of graduation. As a way of coping with my graduation-less future, though, I find it best to indulge in some graduation crafts for those around me. A little self-indulgence now and then isn’t too bad, right? Check out what my most recent search for graduation stuff yielded. 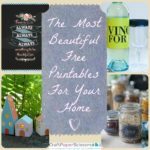 Homemade Gifts for the Grad- Another Excuse to Craft! Make this “Finding My Way” Graduation Gift in time for the morning of his or her graduation. 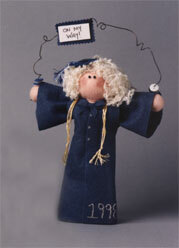 This adorable table decoration will psych them up before they have to make that walk towards their diploma. Maybe you want to go more traditional. Totally fine. 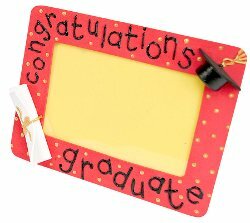 You can utilize the always-appropriate picture frame as a way of gifting to your graduate. The Graduation Frame is a quick and easy project that is entirely tailored for the special day. You can also check out our other famous frame projects to tailor a gift to your graduate’s taste. I was super psyched when I came across this DIY Pinwheel from Style Me Pretty. This project will add a whole lot of fun to whatever shindig you’re holding. Make this grade-A graduation decoration by fashioning these DIY pinwheels in your graduate’s school colors. Maybe you’re a scrapbooking fiend. 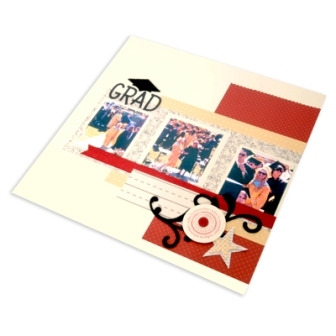 If you’re hosting a graduation party, take it as an opportunity to display a Graduation Scrapbook Page. You can include a photo of the graduate, their accomplishments and even a space for guests to sign. Browse through our scrapbook crafts to get more ideas for this party-pleaser. Don’t forget about a banner! 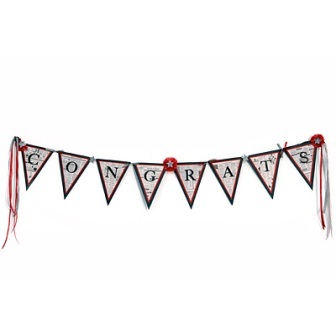 Make this Congrats Paper Banner to add some festive fun to your party. 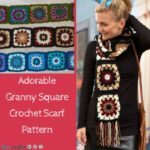 It’s so easy to make and will look gorgeous. String it up and let guests and the graduate celebrate underneath. Time to get crafting on those homemade graduation gifts and decorations. You’re not only crafting gifts and decorations; you’re crafting memories! Do you have a favorite graduation memory? Hello! 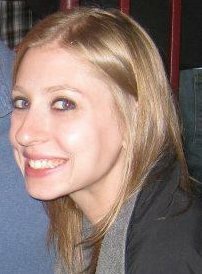 My name is Julia and I’m the editor of two super cool websites, AllFreeChristmasCrafts and AllFreeCrochetAfghanPatterns. 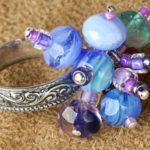 I also bring you the weekly craft business newsletter from FaveCrafts, Creative Income, and work with the wonderful Tiffany Windsor to produce the bi-weekly newsletter, Cool2Craft. I was born and raised in St. Louis, MO, and attended the University of Illinois Urbana-Champaign, where I studied advertising and English. I love movies and television; in fact, I’m one of those people that always have a full DVR to catch up on and list of movies to see on the weekend. I’ve also loved reading for, well, as long as I can remember and always carry a book in my bag. I’m a total fitness nut and love exploring Chicago in my free time! About a year ago, I moved into my first apartment, so I’m adjusting to domestic life on my own. My newest goal is to learn how to bake (I’m constantly collecting recipes and ideas, but I have yet to make anything). I learned how to crochet earlier this year but I still have so much to learn! 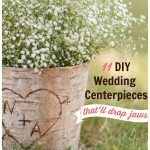 I love so many projects on our sites and I’m constantly inspired to make something amazing! 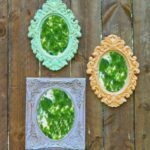 Here are some of my all-time favorite DIY craft ideas that you should definitely check out this holiday season!